The Low Down: Camp Half-Blood is in trouble. Someone has poisoned Thalia’s tree, one of the protections that keeps the camp safe from anyone and anything getting on the property. The only thing that will save it is the Golden Fleece. Percy’s been having dreams about Grover, too. He’s in trouble, stuck on an island with a Cyclops, and his time is running out. Either he’s getting eaten….or married? A homeless boy was given a free ride at Percy’s (latest) high school. Tyson seems a little immature and a bit of a scaredy cat, which is strange, considering how huge the guy is. But when he saves Percy during a skirmish with some monsters, Percy takes him to Camp Half-Blood since Tyson has nowhere else to go. That’s when he finds out that Tyson is a little more than he seems, with an undeniable connection to Percy. With Annabelle, they set out to find the Golden Fleece to fix the camp’s security problem. Along the way, they have an encounter with an old foe, make friends with the hippocampi, help someone with their quest…and bring the tree back to life. A little too well. But was it all enough? Best Thang ‘Bout It: Love Greek myths. Period. And this book is funny. Ever since Indiana Jones, or even Star Wars (the REAL first one), I have loved adventures peppered liberally with snark. The Bottom Line: If you enjoyed The Lightning Thief, you will like the continuation as well. It’s a great series. 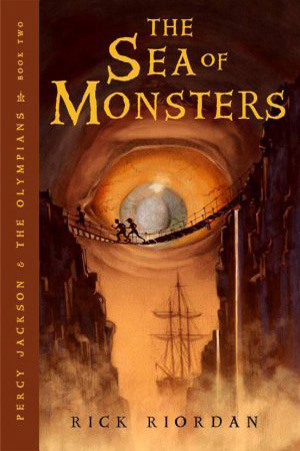 The Sea of Monsters by Rick Riordan was published March 21, 2006 by Disney Hyperion. Ink and Page picked this book up from the library, so no one had a choice about whether it was reviewed. I love this series! I’m really glad you are enjoying it. Each book gets better and better. I really like it and can’t wait to read the next one. My daughter and I read this one together.